Using Hertz 24/7 is easy. All you have to do is sign up once for free. Registration gives you access to all Hertz 24/7 vehicles at participating B&Q stores plus our other locations across the UK and Europe. 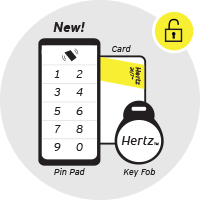 The quickest and easiest way to do this is with our free Hertz 24/7 App. Enter your details once and with our photo function in the app, send your documents in for verification and off you go! 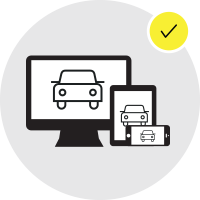 Book: Reserve your Hertz 24/7 vehicle via the Hertz 24/7 app or in-store tablet available at selected locations across the UK. You’ll receive a booking confirmation and vehicle access code by SMS and/or email moments before the start of your rental. 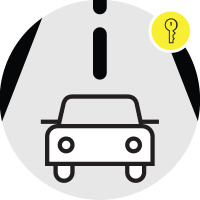 Go: The ignition key is inside the vehicle. Just follow the instructions inside the van and go! *A mileage rate of up to a maximum of 30p per mile will apply when renting with Hertz 24/7. Mileage rates may vary depending on vehicle type selected. Fuel card included to cover any refuelling needs. **You will be required to email in copies of your driving licence if using web registration option. Your application / booking will not be confirmed until this information has been received. Looking for hourly van rental that is free to join? Hertz 24/7™, Hertz’s hourly van sharing service provides vans, available 24 hours a day, 7 days a week, in Europe. And if you are a customer of B&Q, we can help you with the transport home. Get there at your own pace for less with van sharing from Hertz 24/7™.